We are fortunate enough to have a greenhouse in our backyard that we use all year round. There are tons of herbs growing out there so I am always trying to find new ways to use them. 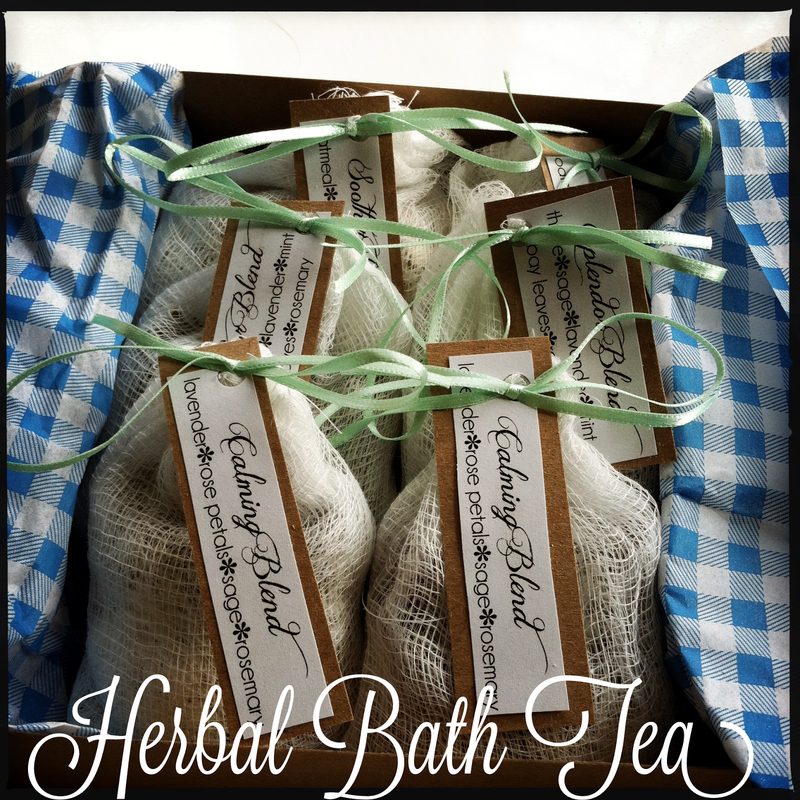 I had heard of the health benefits of herbal teas for the bath, so I did some research and this is what I came up with. This is a really fun and simple project with very luxurious results. I made these for some of the ladies in my life for Christmas. Bath teas are great for stress relief, aches and pains, and are soothing for your skin. The aromas that release are heavenly! It’s like your sitting in your own private cup of tea! I packaged these lovely little teas in two different ways. One way was for giving someone a large batch of one particular kind of tea. I used little glass jars with printed craft labels and wooden spoons attached to the side, and one reusable cheesecloth drawstring bag. I regrettably forgot to take a picture of this version, but you get the idea. The next way of packaging was to give a box filled with a variety of pre-bagged mixes of the bath teas. I quickly sewed up some little drawstring bags out of cheesecloth and used pretty ribbon for the ties. You could use muslin, or organza as well, and I think you can find them pretty affordably at your local craft store if you don't want to make your own. I also whipped up some cute labels for each mix that I made to tie to the bags, and then one for the lid of the box. I’m one of those crazy people that LOVES wrapping presents, so I always take extra care when packaging something I made, it seems to make it a little bit more exciting to see what’s inside! really tight and let them float in the tub as you soak. Talk about a spa treatment! What combination of herbs and flowers would you use?